The next key aspect is to ensure our baseline code is checked into our source code repository management server which is Git. To do this, we need to follow these steps. Step 1 − Initialize the repository so that it can be uploaded to Git. This is done with the git init command. 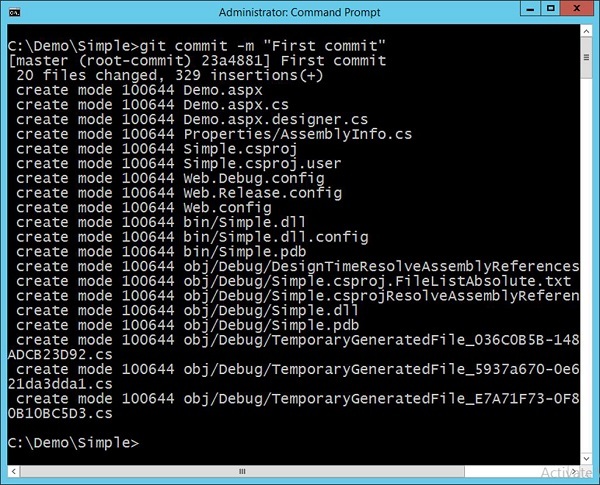 So you need to go to your project folder and issue the git init command. Step 2 − The next step is called staging files in Git. This prepares all the files in the project folder, which need to be added to Git. You do this with the git add command as shown in the following screenshot. The ‘.’ notation is used to say that all files in the directory and subdirectory should be included in the commit. Step 3 − The final step is to commit the files to the Git repository, so that it is now a full-fledged Git repository.